Sun's Presenter Console is a plugin for Open Office that is available for all supported operating systems including Microsoft Windows, Linux, Mac OS X and various other systems. The main purpose of the Open Office plugin is to aid presenters during presentations by displaying additional information on their screen. It works by showing the presenter information that is not shown to the audience. 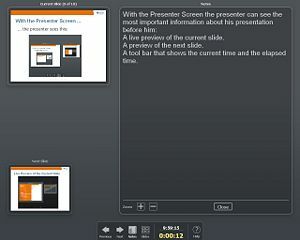 A typical example would be a situation where a laptop and beamer would be used during the presentation. The laptop would display the additional information to the presenter while the beamer would simply display the current slide of the presentation. The presenter console displays the current slide, a smaller preview of the upcoming slide and a tool bar with navigational buttons and the current and elapsed time. There are additional options to display the notes of the current slide and view a slide overview which is also excellent for quick navigation. 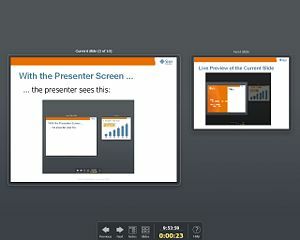 The presenter console will automatically detect if more than one screen is available. Sun's presenter console is able to detect the screen that is used for the presentation and will automatically display itself on the other display. Now this is cool! I’ve always wanted something like this when doing presentations. Is there something for like this for Powerpoint? Otherwise, you’d have to install Open Office and then convert your Powerpoint slides. Jojo: PowerPoint has a presentation mode. You need at least two computer monitors though and can activate it in PowerPoint 2007 by selecting the second monitor under the Slideshow ribbon.